It's no wonder that our minds seem to wander off to warmer climes as December begins. The winter chill has well and truly set in! The temperature creeps closer to zero each icy morning and the hours of sunshine seem to dwindle every day. A December villa holiday is your perfect escape. Your last chance of the year to grab your fix of vitamin D. Below you'll find a few destinations that offer average monthly temperatures in excess of 20°C – so you could be feeling the sun on your back before you know it. The beach is never out of bounds with a winter sun getaway, of course. But we're focusing on all the activities that are tailor-made for this slightly cooler month. Your December villa holiday is your ticket to escaping the winter freeze while making some unforgettable memories. Pleasant temperatures are just a few hours away in Fuerteventura or Tenerife, while Antigua offers irresistible Caribbean vibes. The icy mornings will seem like a distant memory as you bask in the sun and explore your striking surroundings. We’ve suggested some top picks below which guarantee villa holiday bliss. With its year-round breeze, Fuerteventura offers incredible windsurfing conditions whenever you choose to visit. Although December could be the ideal month to try your hand at it. If you’re a windsurfing newbie, Corralejo offers calmer winds at this time of year – so finding your feet is a little easier. If you’re an old hand at riding the surf, the south of the island is your December haven. There’s stronger winds here that present a tougher challenge – so every gust offers a rush of adrenaline. 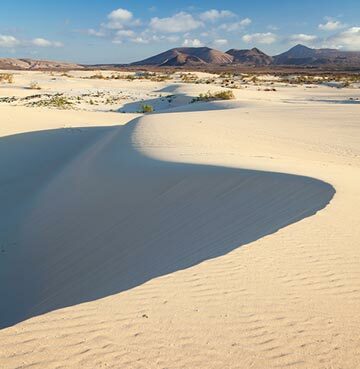 The sand dunes of Corralejo feel like your own desert safari! Tucked between the white sand beaches and dark volcanic mountains, stretching your legs here guarantees breathtaking views. You’ll even spot Lanzarote and the island of Los Lobos in the distance. There’s just as many amazing ambles waiting for you inland too and there’s nowhere better than Betancuria. Nestled in a lush valley, the greenery and mountains are the perfect backdrop for the village’s whitewashed buildings. A leisurely stroll here offers the perfect blend of Canarian tradition and Fuerteventura’s natural beauty. The Anaga National Park covers the northern tip of Tenerife and trekking here opens the door to a gateway of island discovery. One of the highlights has to be the dense forests you’ll find here. There’s a fantastic tropical feel and you’ll spot rare plantlife and exotic trees as you wander under the canopy. Your visit also offers a glimpse at traditional Tenerife. The villages here have a real undisturbed feel, tucked away among the greenery and mountain peaks. 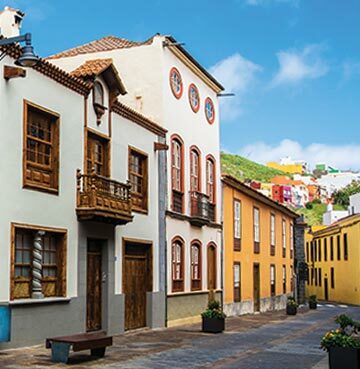 Off the beaten path and far from the clutches of tourism – this feels like the true Tenerife. Getting closer to the coast means that you’ll spot another of the island’s finest natural sights. The Roques de Anaga sit just off the very tip, with these towering rock formations standing tall in the surf. It’s not all just mountains, forests and trekking in Tenerife. There’s plenty of culture to cram in on your villa holiday here! If you’ve spent plenty of time hiking across the volcanic terrain, a leisurely stroll through town might be just what the doctor ordered. And La Laguna is the perfect prescription for those tired legs. Dating back more than 500 years, the Old Quarter here is packed full of historic buildings and colonial architecture. Explore one of the impressive churches or enjoy the finer things in one of the palaces here – it’s all up to you. December’s average temperature of 26°C sits just under those of the summer months. So although we’re not focussing on too many beaches, we’d be crazy not to boast about the coast on this Caribbean island. 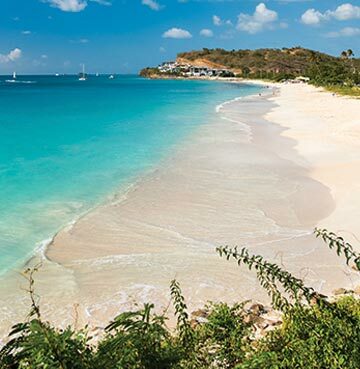 After all, Antigua is home to 365 breathtaking beaches! These are the idyllic white sands, palm trees and turquoise waves that tropical dreams are made of. The east coast’s Atlantic winds create excellent conditions for windsurfing. Each year the island’s sailing regatta attracts competitors from all over the world, who flock in search of the brilliant breeze. The west coast is a little calmer, so this is your chance to take a kayak out into open waters. Enjoy the scenery from a different perspective, as you paddle through the crystal clear sea. For those that love culture, there’s plenty to discover beyond the beaches. The island has a fascinating past, so why not open the Antiguan history books and head to one of its colonial monuments? Shirley Heights was once a lookout point, used to keep an eye out for unwanted visitors. Today you’ll find the military fortifications still standing strong, but the scenery here is the real star of the show. With postcard perfect views over English and Falmouth harbours, you’d imagine that lookouts were more than happy with their posting here. If you want to sneak a closer glimpse at English Harbour, head over to Fort Berkeley. These ruins offer amazing views of the colonially-named bay they once protected. Just a short walk away you’ll find one of the finest colonial landmarks in this corner of the world, Nelson’s Dockyard. This UNESCO World Heritage site is a beautiful Georgian harbour, decorated with impressive stone pillars. And it’s not just a tourist attraction either! This is still a functioning dockyard today, so expect to see ships coming in and out of port. The Admiral’s former home is now a museum, giving you a greater insight into the story behind this wonderful harbour. If you're a little unsure about a December getaway, why not start the year in style with a January villa holiday? Or relax and unwind before the busy Christmas period with a November villa holiday?